In this area you can add scripts for advertising like Google AdSense or simple custom links to websites you choose, which will then be displayed between search results on the frontend. In the Notifications section you will find all the email notifications that will be sent to users for different actions, such as receiving a new message, receiving a new rating or for account activation. Here you can also add new ones, edit them, delete them or publish/unpublish. Click on any of them to edit or check the tickbox and click on Edit. 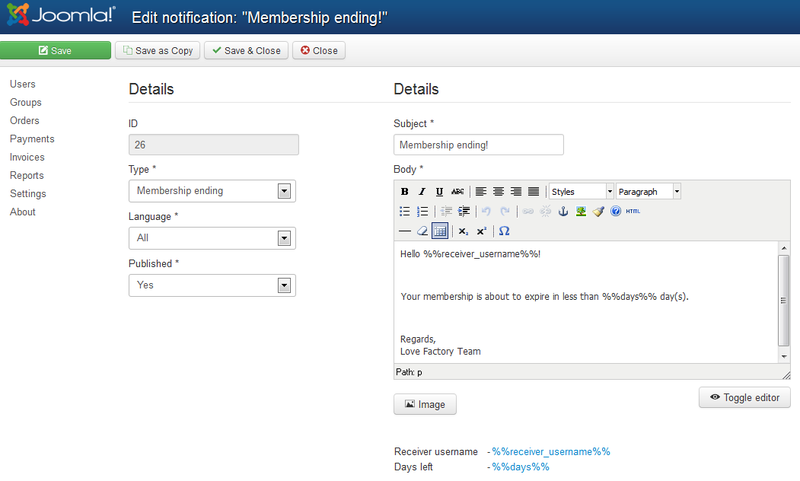 Here you can change the type of notification, the assigned language or its publish status. On the right side you will find a simple text editor where you can modify the message and the subject of the email received by the user. The "Backup & Restore" section allows you to safely make a backup of all the data found in the database, like users profiles, ignore lists, comments, friends, interactions, etc. The backup file will not contain the templates and the user's photos! This will have to be backed up manually! To make a backup, first choose if you wish to include the settings or not and click on "Create Backup". Remember to always test your backups! A broken backup is no good later on. To restore a backup file click on the "Browse.." button and chose the .zip file from your computer, then click on "Restore Backup". Be aware that restoring a backup file will erase all your existing data! Starting with version 3.5.0, restores are no longer backwards compatible. Backups will restore only on the same version they were made on.